2001. Exciting and effortless sailing on a comfortable and well equipped catamaran. Accommodations are well considered, making good use of the space. 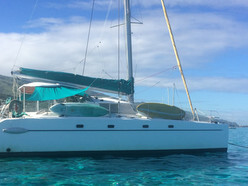 A four double cabin, two single cabin ex-charter vessel in good working condition, ready to cruise.